2 Planning Checklist I thought about what interests me the most about my topic. I wrote down things I already know about my topic. I wrote down things I want to learn about my topic. I thought about what my audience would want to know about this topic. I came up with a general observation and a specific focus for this topic. 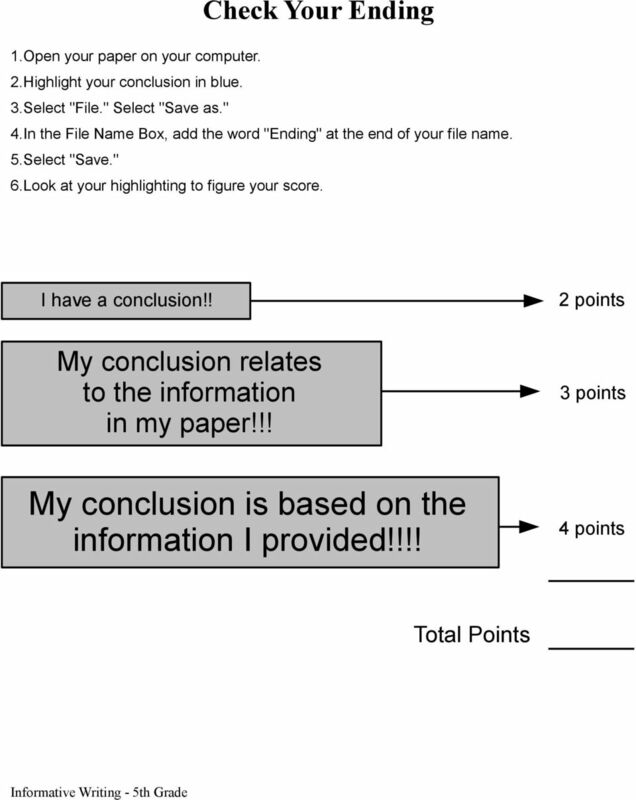 I made an outline that answers the requirements of this assignment. I read and understood articles and/or books about my topic. I found concrete, specific details about my topic and/or specific examples that relate to my topic. I investigated different aspects about my topic. I took accurate notes about what I learned. I used my own words in my notes. I used sources that I trust. I used different sources. I wrote down interesting quotations from my sources. I made a list of my sources. The information I gathered relates to my topic. The information I gathered is interesting. The information I gathered is important for my topic. 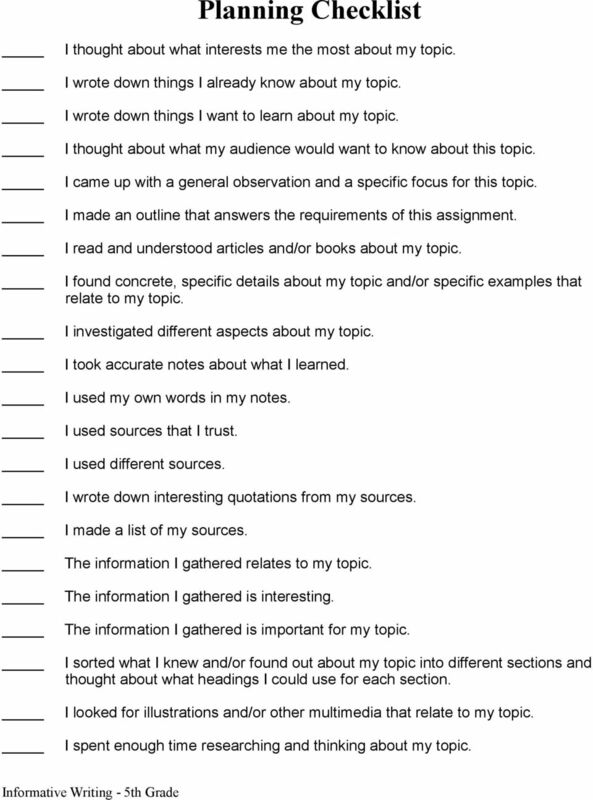 I sorted what I knew and/or found out about my topic into different sections and thought about what headings I could use for each section. I looked for illustrations and/or other multimedia that relate to my topic. I spent enough time researching and thinking about my topic. 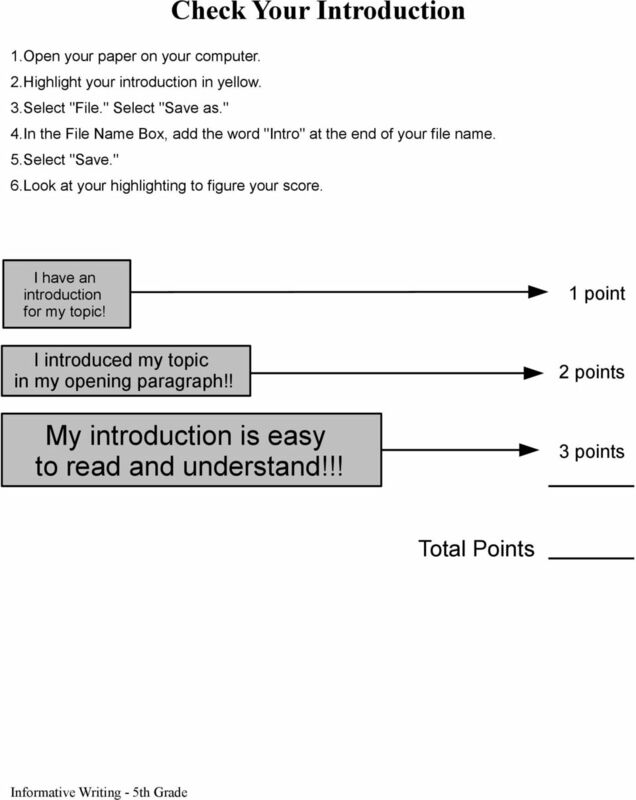 5 Check Your Introduction 1.Open your paper on your computer. 2.Highlight your introduction in yellow. 3.Select "File." Select "Save as." 4.In the File Name Box, add the word "Intro" at the end of your file name. 5.Select "Save." 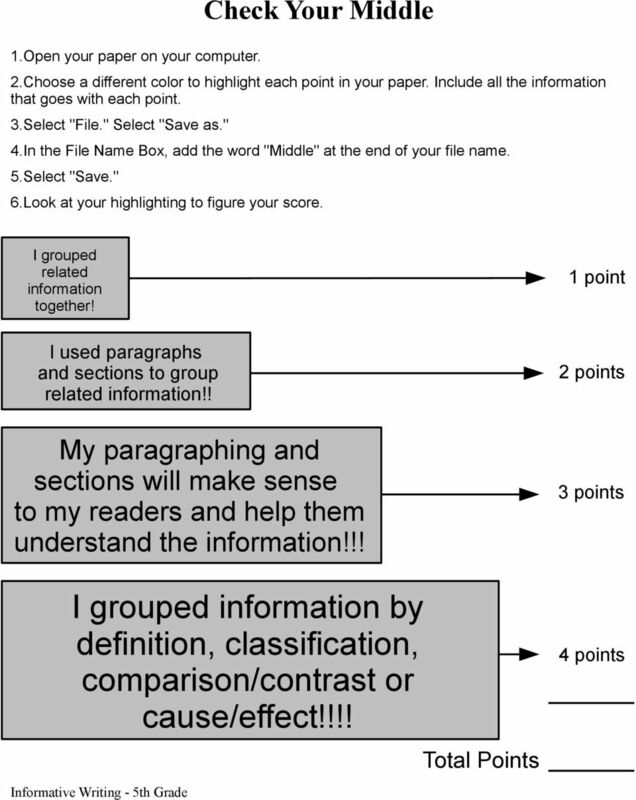 6.Look at your highlighting to figure your score. I have an introduction for my topic! 1 point I introduced my topic in my opening paragraph!! My introduction is easy to read and understand!!! 8 Check Your Wording 1.Open your paper on your computer. 2.Highlight words that are specific to your topic in yellow. 3.Highlight descriptions of actions or emotions in blue. 4.Highlight comparisons of ideas or information in green. 5.Select "File." Select "Save as." 6.In the File Name Box, add the word "Wording" at the end of your file name. 7.Select "Save." 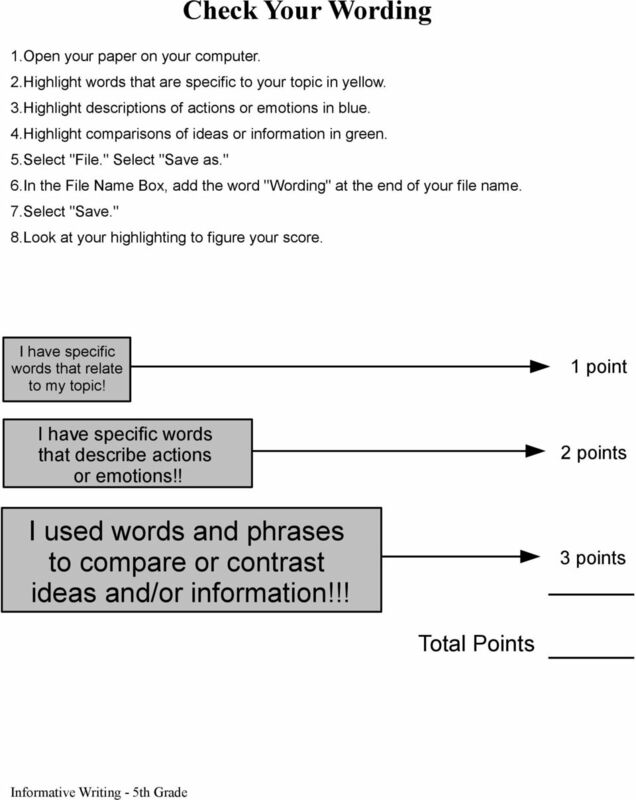 8.Look at your highlighting to figure your score. I have specific words that relate to my topic! 1 point I have specific words that describe actions or emotions!! 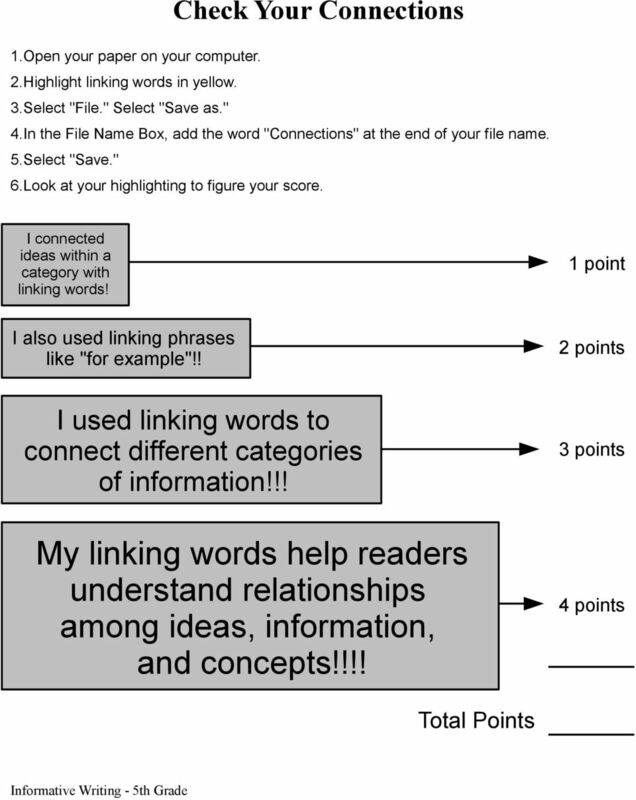 I used words and phrases to compare or contrast ideas and/or information!!! 9 Check Your Effect 1.Open your paper on your computer. 2.Highlight words and phrases that will affect your readers in yellow. 3.Bold words and phrases that show how you think or feel about your topic. 4.Italicize phrases and clauses. 5.Select "File." Select "Save as." 6.In the File Name Box, add the word "Effect" at the end of your file name. 7.Select "Save." 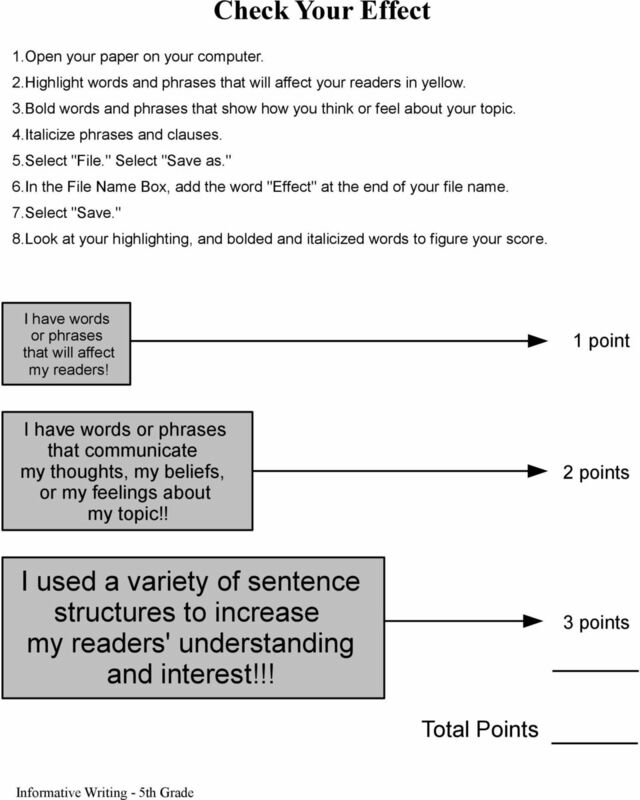 8.Look at your highlighting, and bolded and italicized words to figure your score. I have words or phrases that will affect my readers! 1 point I have words or phrases that communicate my thoughts, my beliefs, or my feelings about my topic!! I used a variety of sentence structures to increase my readers' understanding and interest!!! 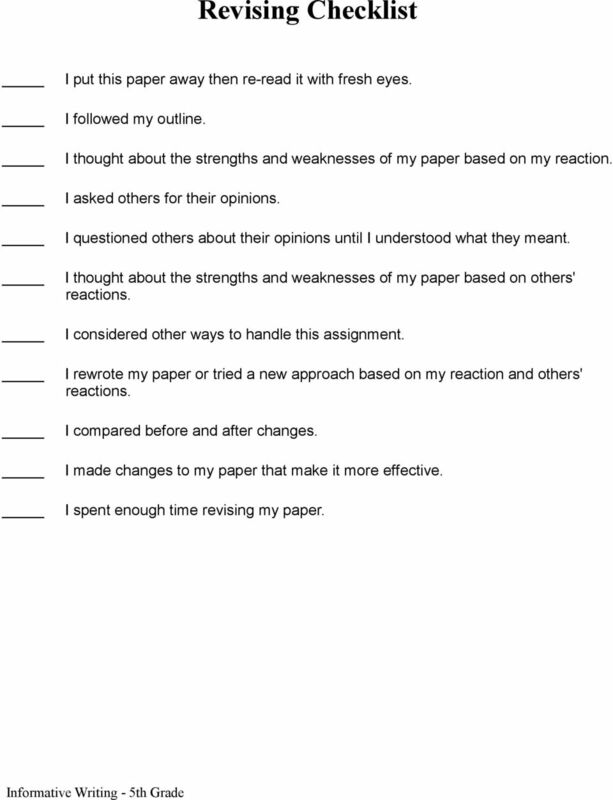 10 Revising Checklist I put this paper away then re-read it with fresh eyes. I followed my outline. I thought about the strengths and weaknesses of my paper based on my reaction. I asked others for their opinions. I questioned others about their opinions until I understood what they meant. I thought about the strengths and weaknesses of my paper based on others' reactions. I considered other ways to handle this assignment. I rewrote my paper or tried a new approach based on my reaction and others' reactions. I compared before and after changes. I made changes to my paper that make it more effective. I spent enough time revising my paper. 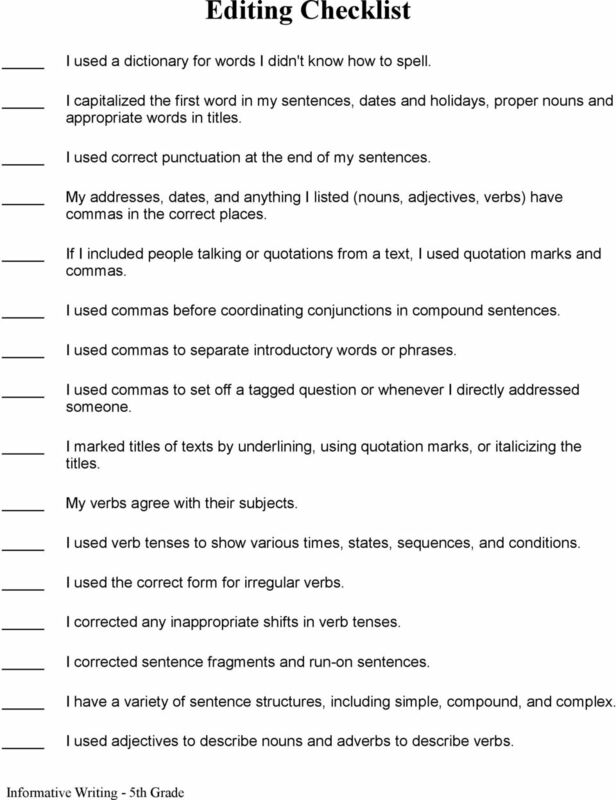 11 Editing Checklist I used a dictionary for words I didn't know how to spell. I capitalized the first word in my sentences, dates and holidays, proper nouns and appropriate words in titles. I used correct punctuation at the end of my sentences. My addresses, dates, and anything I listed (nouns, adjectives, verbs) have commas in the correct places. If I included people talking or quotations from a text, I used quotation marks and commas. I used commas before coordinating conjunctions in compound sentences. I used commas to separate introductory words or phrases. I used commas to set off a tagged question or whenever I directly addressed someone. 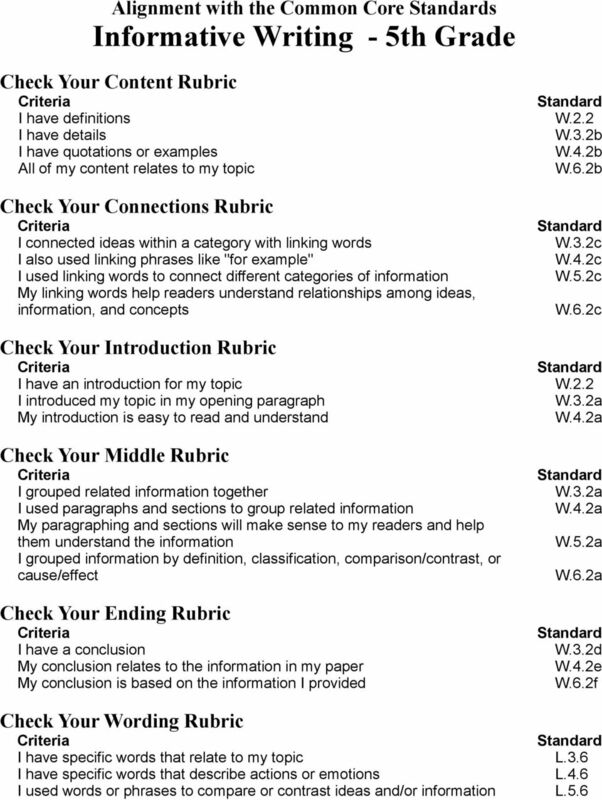 I marked titles of texts by underlining, using quotation marks, or italicizing the titles. My verbs agree with their subjects. I used verb tenses to show various times, states, sequences, and conditions. I used the correct form for irregular verbs. I corrected any inappropriate shifts in verb tenses. I corrected sentence fragments and run-on sentences. 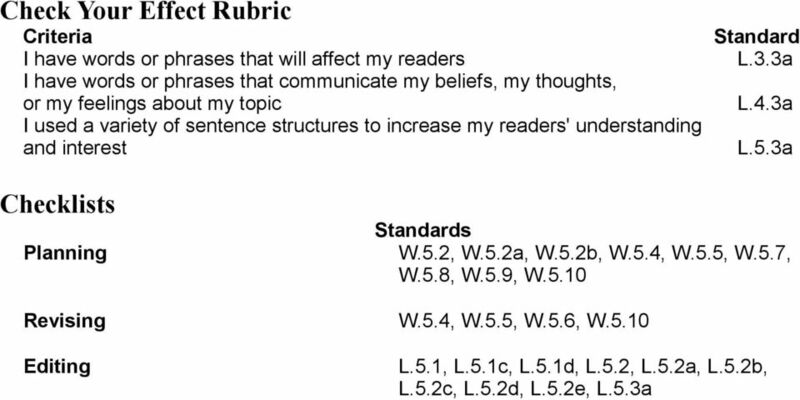 I have a variety of sentence structures, including simple, compound, and complex. I used adjectives to describe nouns and adverbs to describe verbs. I Can Read. (Reading Foundational Skills) I can use what I have learned about letters, sounds and words to help me read. I Can Read (Reading Foundational Skills) I can use what I have learned about letters, sounds and words to help me read. RF.4.3 I can show what I have learned about letters, sounds and words in my reading. 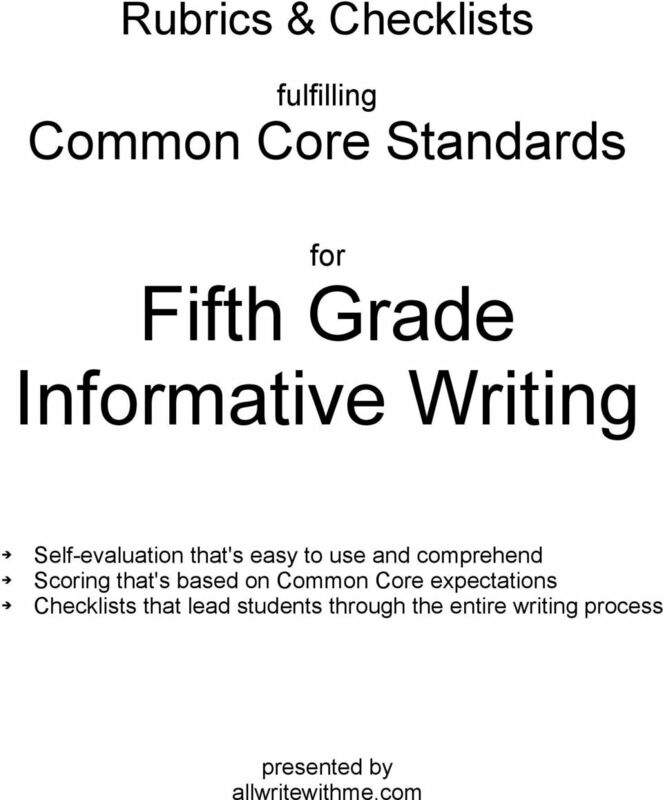 Fourth Grade Language Arts Learning Targets " Common Core Strand Standard Statement Learning Target Reading:! I can draw inferences from a text and refer to details and examples in the text when RL! "!